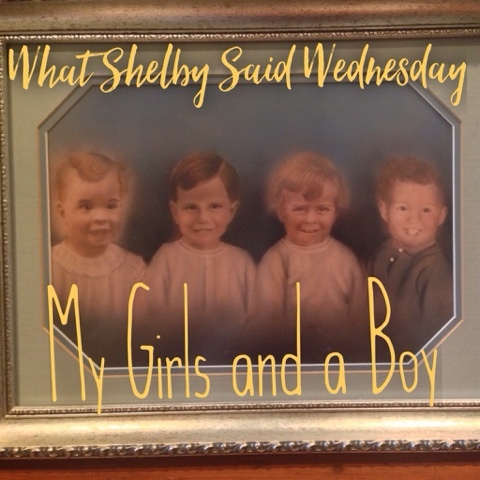 While we were visiting my parents last week, Shelby started talking about "her kids." Anytime we left the house she was carrying them on her shoulders. She'd make us wait while she gathered them up, and told me there were "girls and one boy." I didn't think too much of it, she often pretends she has a baby. It was a little odd that she was so specific. But she is an imaginative little girl so it wasn't really surprising. One afternoon she was playing in the mud room, and I heard her talking to "her kids" again. Then she wanted me to come see them. Happy to oblige such delightful play, I followed her. And she showed me a portrait of her babies, three girls and a boy. It turns out it was a collage of portraits of my Grandma Harvey and her siblings as babies ... Uncle Alec (apparently short for Alexander, all my life I thought his name was "Uncle Ellick" ... that's a whole ' other story I guess), Uncle Jimmy, Aunt Mildred, and my Grandma. I realize that is two boys and two girls ... poor Uncle Alec is wearing something rather frilly and has wispy blond hair. Do you ever tire of finding out the source of something slightly odd your child is saying? My hope is never to tire of the laughable surprises Shelby comes up with.